From our motorcoaches to our drivers, Cardinal you provides you with excellent customer service! Come on Along! Nobody knows the ropes or the roads better than our men and women in uniform. We love kids. Kids love us. It's a classy combination. 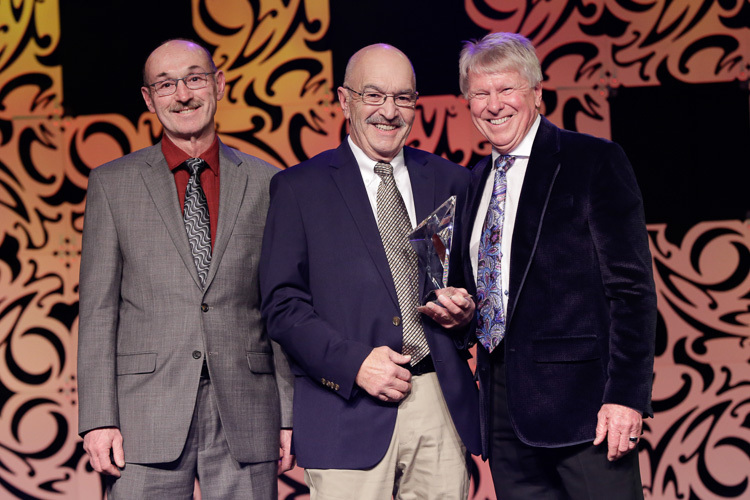 Cardinal Buses 2018 Large Fleet Vision Award Winner! Matt Shoup and Dan Shoup (MBMCA Board Director), Cardinal Buses, Middlebury, IN, accept the award at UMA's Leadership Awards Celebration in San Antonio, TX. Cardinal Buses is a charter bus company located in Indiana and Michigan, offering charter bus rentals for all occasions. We look forward to serving your group from our transportation locations in Northern Indiana and Michigan to anywhere the US and Canada! Your Cardinal Buses' quote is individually prepared by our sales specialist and returned to you either the same day or within the next business day. Our goal is to give you excellent service from start to finish! Cardinal is the premiere bus charter services company. Book your charter bus with us today and you'll experience the Cardinal Difference! The Cardinal difference is backed up by our 95 years as a family owned and operated business. 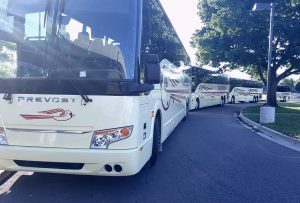 Our experience in sales and operations, our outstanding drivers, maintenance staff and our late model charter buses all results in your group enjoying a hassle free, enjoyable charter bus trip to anywhere in the US or Canada. Cardinal Buses' depth of knowledge and expertise in the charter bus industry means your trip on board a Cardinal Bus motorcoach is safe, professional, comfortable and relaxing. Come on Along! Cardinal Buses is currently accepting applications for motorcoach drivers. We are looking for drivers with a clean driving record and have or able to qualify for a Class "A" or "B" CDL license with "P" (passenger) endorsement. Drug test and physical required. Training is available for the right individual. To apply please click here or call for appointment at 800-348-7487. Cardinal Buses Welcomes All Passengers. Cardinal Buses offers ADA accessible vehicles. 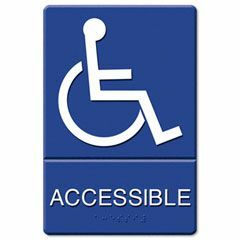 Please contact us with any questions or Click here to get more information about Cardinal Buses' Customers with Disabilities Lift Accessible Charter Buses. Get connected with Cardinal Buses' free WiFi and stay connected with 110 volt outlets spaced throughout our motorcoaches! Student athletes can make the most of their time by keeping up on school work and coaches can check on competitor's scores while business executives can stay in contact with the office and check flights! 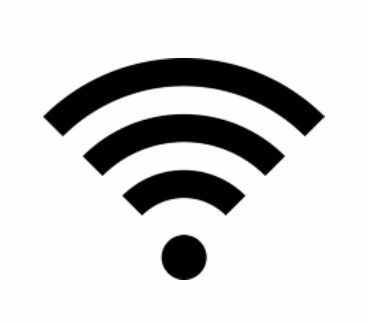 Request your wifi equipped motorcoach today!